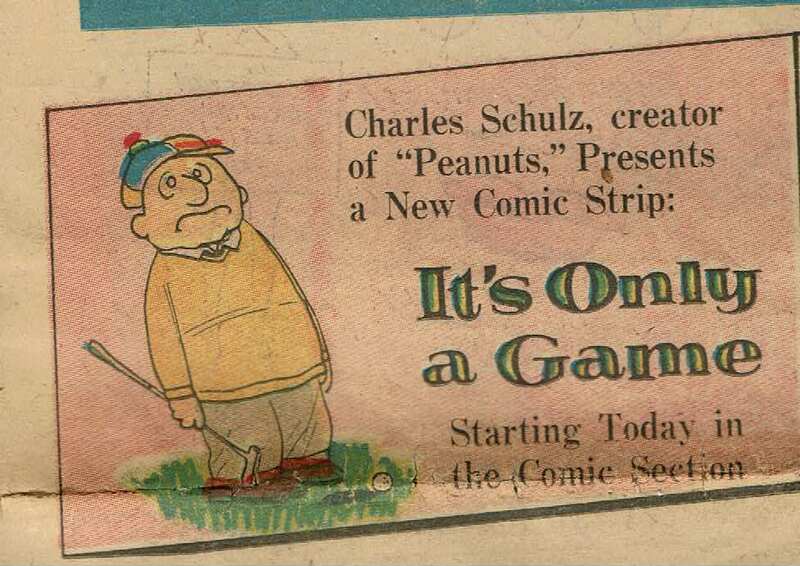 While Schulz’s collaborator on It’s Only a Game, Jim Sasseville, would say that the strip was in the same number of papers at the end as when it launched, that doesn’t mean that no papers added it along the way. Here, for example, is the announcement of the feature’s debut in the Minneapolis Sunday Tribune on January 12, 1958, a short ways in the run. It’s not clear whether the paper had just started subscribing to it, or had been subscribing but not running it in the previous weeks. (Papers sometimes did that to keep a strip out of the hands of the competition, or to be ready when they dropped another strip.) This was an above-the-fold ad on what would’ve been the outer wrap of the Sunday paper, so it was not a minor thing. 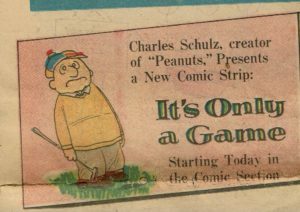 This comics section also had Peanuts on the back page, although they only ran the two-tier version of the Sunday rather than the full three tiers.